Simplicity is the path to simplicity! And that’s the beauty of simplicity. You can simplify your life by taking small simple quick actions that make a HUGE difference. This is a very powerful decluttering tactic. We tend to fill our spaces with too many things that we don’t actually need. And the only reason we keep them is that we are worried about what would happen if we need them in the future. For example, are you worried about throwing away an AC adapter from an unknown item?! For example, if you followed Dr. Weil’s 8 Weeks to Optimum Health plan, you would know that a 10 minute walk is much better for your health than working out in a Gym. So, save your Gym membership and replace it with a 10 minute daily walk in nature. I know this one is hard because news are hunting you every where you go. But try as much as you can to decrease your news consumption. Everyone is obsessed with owning things, instead of sharing things. Before you buy something ask yourself, “Can I borrow it?” Specially, if you’re not going to use it frequently. Share meals, apartment, free invites to places where you have membership, etc. Think sharing instead of owning. Money is a big factor in our decision making process. Try once a month to do something out of pure joy and desire, and don’t make money as a deciding factor. If you really love it and want to do it, just do it. Once a month or every quarter or whatever. Do something without much consideration of money. This is a long term goal that you should set today. Life is meant to be lived doing work we love, instead of work that pays the bills. If you’re living paycheck to paycheck, start simplifying your life and making a safety net by saving one year’s worth of living expenses. Once you have that, quit your job and pursue something you’re truly passionate about. 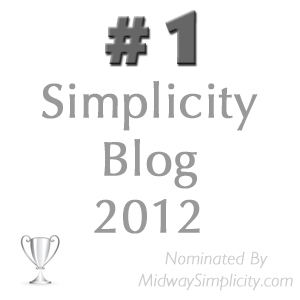 Bio: In his blog, www.MidwaySimplicity.com, Mohamed Tohami shares simple living ideas that fall midway between extreme frugality & radical minimalism and the hoarder’s extreme fear of deprivation. If you’re looking for more mainstream simple living ideas that are not too harsh for your lifestyle, then give a visit to Tohami’s Midway Simplicity blog and grab your copy of The 30-Day Simplicity Challenge ebook. Declutter something that matches with the questions below. Awesome Raesha! You proved to us that joy is not about spending more, instead it is all about experiencing more. Thanks a lot for sharing your interesting story with us. A good post. Some good points to give to someone who is just starting out especially. I especially like the one about a “news diet”. We have a TV we never watch. Our news comes from the internet occasionally. I haven’t felt like we have missed anything. I have stated that to me the news is like a soap opera. If you watch it once a week you can keep up. It’s also done in such a way that it’s sensationalized. I like to share many things with friends. I have to be careful though because some friends have a different outlook toward things. I take care of them because I don’t want to replace them. Many don’t do this but instead figure they can buy a new one. I figure that I am better off reading the news online because I can choose what to read. I’m tired of the sensatialism we get here. The other day I was at someone’s home and the news was plugging the next segment as it was going to commercial break. When they came back the whole thing was about a medecation trial that was in the first stages and it would be 10 years before we really knew whether the med would really happen. So why tell us?! YOu can here on the news for a week about some decision the Congress is going to make and they will discuss it to death on the news and then it comes time for the vote and it gets tabled. I don’t want to hear anything but whats up for vote and what the vote was. I don’t want to hear the opinions of 30 other people who have nothing to do with the vote itself. So I pick and chose what I want to read online. Sure saves all that junk. I like how you see the news as a soap opera. You’re right, we won’t miss that much if we checked in the news once a week or so. Eliminate my news media time – interesting! I’m in Sydney, read (skim) the paper online (fewer trees dies etc). But in the last few months I have noticed that very many of the stories that make the headlines are salacious rubbish. For example, yesterday we had features on a gay Canadian necrophilliac, a “zombie” canibal in the US and lately there have been a spate of articles that put women down in various ways to do with their appearance – usually based on spurious “studies”. The sensationalising of what are clearly seriously mentally ill people involved in tragedies and the relentless trivialising of social problems just makes feel grubby after reading. Of course people could say well don’t read those stories. And they are right, so I will stop for a week from now and see if my view of the world improves. I know that totally giving up womens magazines was a liberating experience for me, maybe this will be the same! Super! I would love to know about your results Calico. Please email me at the end of the week and let me know how it went. Spot on, Mohamed. I started a semi news fast years ago after hearing Dr. Weil suggest it in an interview. It is absolutely amazing how different you feel when you limit your exposure to the news. I know just enough and no more. 24 hour news cycles, internet, twitter, facebook, ipads, pods, cell phones….it’s all too much. You nailed it Kimberley … Just enough and no more! I’ve never been a fan of watching the news. Growing up, both my parents would get so wound up when watching the news & don’t EVEN get them started on politics. Sheesh! Anyways, watching the parents get in such a mood from watching the news & fussing about things they can’t change with the world was enough to make news watching unappealing for me. Occasionally I get a wild hair & will read the 1 or 2 line headlines on Google News very so often & know enough to be ok. The exception is when a hurricane is approaching my area – then I perk up & watch the local news/NOAA like a hawk. I am not in the dark totally on world news or even local news – there’s enough ways to get wind of the latest world crisis or local fervor without having to watch the evening news. Plus, most news anymore is really glorified speculation of what might happen (ala Mayan calendar) or what did happen (can’t change the past) or what celebrity got liquored up again (yawn). I agree with you Jane. We can’t be in the dark totally on world news, unless we live in a small hut in the forest 🙂 Like Kimberley said, “Just enough and not more”. Media always exaggerate and speculate things. Raw news is much better for our well-being, like raw food! Love this post & have subscribed to his blog already, thanks. Got back on the decluttering wagon today, tossed some stuff I had kept hoping to repurpose…one day. Thanks a lot Karen for subscribing to my blog. I’m glad you like what I am sharing. Interesting idea about restricting your exposure to the “news” and whether you miss out or not. I don’t have a TV and listen to high quality news on BBC radio and read the skim-read local papers to catch up on things of purely local relevance. At one time in my life, I used to get cast-off newspapers from my then-housemates, a few days old. These were reputable newspapers with award-winning journalists and one thing I noticed was that much of the initial coverage given to anything turned out to be misinformed, over-dramaticised and just plain wrong, and was revealed as such by 2-4 days’ seasoning. And these were some of the most reputable UK national papers, not some gutter tabloids. And, as as been remarked, a lot of so-called news is trivia about Z-list celebrities………. I am writing a discourse analysis at the moment. I am reading a lot of newspaper articles from the last 10 years. let me tell you, there is no such thing as right information, everything that people (journalists, politicians, “normal” people) say, is only their idea of truth and reality. and there are a lot of different realities out there. so spreading misinformation, over-dramaticising and in the end telling plain wrong things is the normal way of (any sort of) news. thats how it was, is, and always will be. Oops, typo alert!. I meant “not get” of course! News media has one objective … Sell more! So, they have to dramatize everything and make use of our curiosity hot button. Too right, Lena. Being of the cynical persuasion, I tend to think to myself “cui bono?” and “why am I/ we being told this?” It helps to try to see where the strings are leading back to the puppet-masters. Hi. I especially enjoyed number one, its a topic I’ve been reading up on and giving some thought to lately. Yes, Moni. It’s interesting how much we hold on useless stuff. Give it a try and experiment how it feels. I really enjoyed this guest post too! I dO totally agree with the news fast-I was not that aware of news recently, and I felt foolish in social situations. So now I try to be a little more aware. But I am certainly not obsessed, I haven’t read or heard any thus weekend. Hi Snosie, I encourage you to explore your passions. Because loving what you do is a totally different experience than ‘liking’ what you do. Thanks Mohamed – I think the issue is working out what I love!! You’re right! That’s the real challenge. I’ve created a course on that if you’re interested. It’s called How To Make Your Life Important. We did without news media or any type of electical things -phones, mobiles, tv or radio last November when on a holiday where there was no coverage. It was bliss.